Announcing the new Graphite Wireless Charger is a recipient of the iF DESIGN AWARD 2018 for best charging product. The iF DESIGN AWARD is in its 65th year and has been a globally recognized trademark for excellence in design. The Graphite Wireless Charger is the recipient of the iF DESIGN AWARD in the Charging Product category and is featured on the iF WORLD DESIGN GUIDE, in the iF design app, and displayed at the iF design exhibition in Hamburg, Germany. Compact size and sleek design make the charger a convenient travel companion and a complementary feature in any setting. Powered via USB-C with an included USB-A to C cable, the Graphite Wireless Charger operates most efficiently when connected to a USB power source that can output 5V 2A. The charging base provides up to 5W of power as soon as an enabled device is placed on the flat charging surface. Successful charging is confirmed by a solid green status light. A red solid light indicates the device is in standby mode, and flashing red indicates a misalignment between the phone and charging surface. Phones charge, screen up, in any orientation on the charging surface, even with a case as thick as 3mm. The non-slip charging surface keeps the phone secure and scratch-free, while the rubber feet and solid body hold the charger in place on any flat surface. 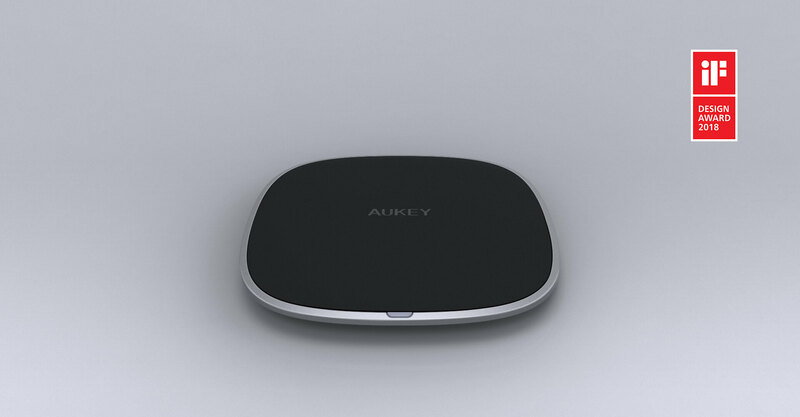 The AUKEY Graphite Wireless Charger is now available for sale on our official stores.